Green Streets & How They Work. Green streets are landscaped spaces that transform street surfaces into living stormwater management facilities. 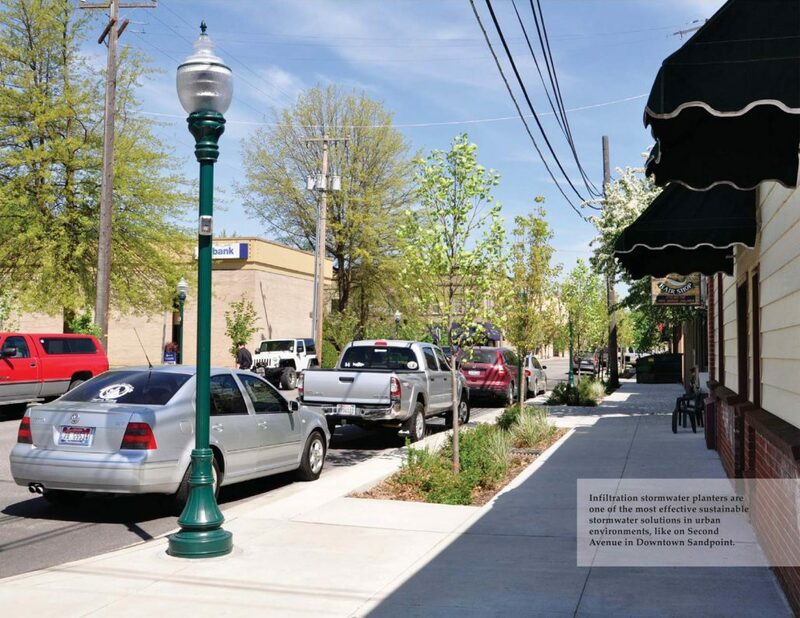 Green streets capture stormwater runoff from adjacent streets and sidewalks and allow stormwater to infiltrate into the ground as plants and soil filter pollutants. 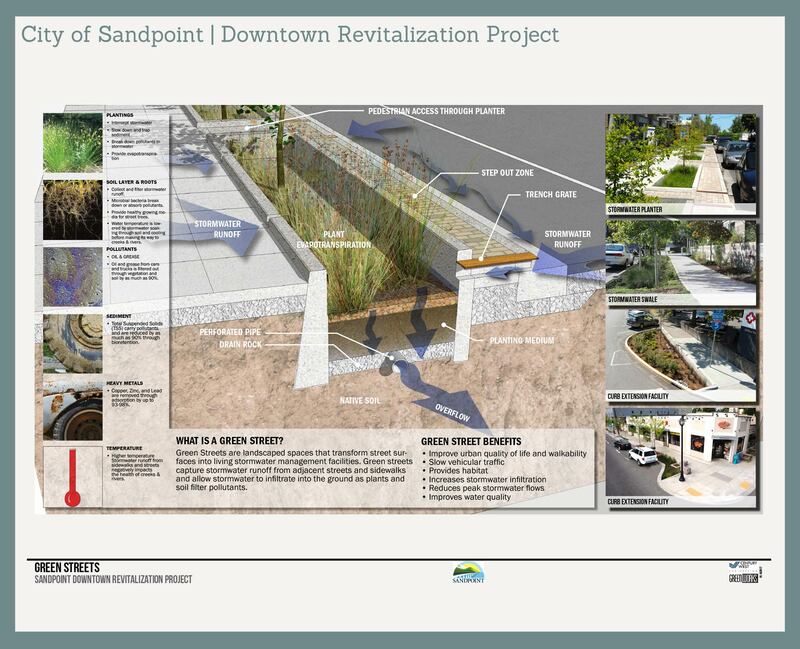 Infiltration stormwater planters are one of the most effective sustainable stormwater solutions in urban environments, like on Second Avenue in Downtown Sandpoint. Lake Pend Oreille is one of Sandpoint’s most beloved and invaluable resources. The community has a vested interest in keeping the water clean so that it can be enjoyed for many generations. Currently, the majority of the stormwater run-off (rain and snow melt) from streets, parking lots, sidewalks, and some buildings in Downtown is untreated and piped directly into Sand Creek and Lake Pend Oreille. Sustainable stormwater management is the practice of replicating natural systems to capture, clean, and detain polluted water before it enters those waterways or filters back into the groundwater. Current best practice designs for Green Streets generally utilize some combination of landscape and infiltration systems, including porous pavers, bioswales, flow-through planters, rain gardens, and/or other features to capture, slow, and treat stormwater before it flows into the nearest waterway. These on-site stormwater facilities are often supported by a more traditional storm sewer or culvert system, particularly in existing urban areas where such systems already exist. 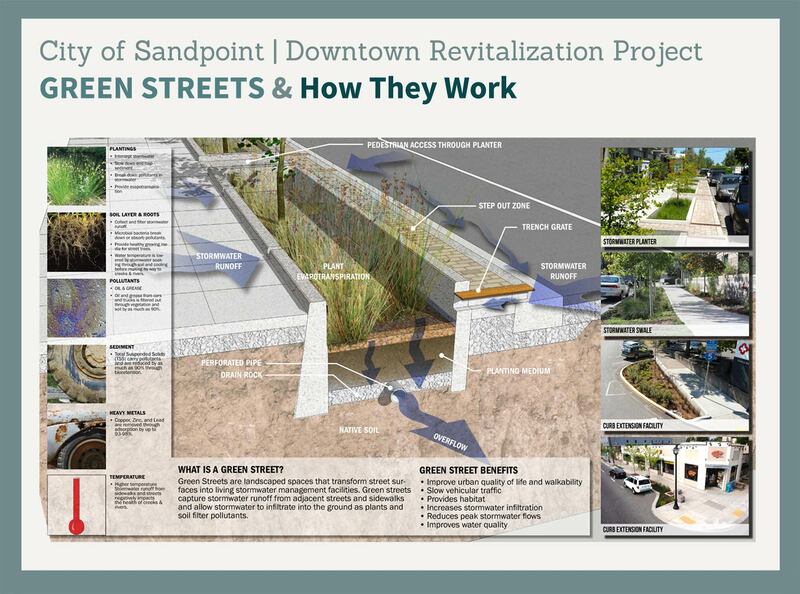 The City has demonstrated its commitment to sustainable stormwater management solutions by constructing landscaped infiltration and detention stormwater planters as part of the Second Avenue streetscape project, and mandating that on-site stormwater treatment facilities be included as part of future street reconstruction projects in the Downtown Core (Ordinance 1253). Because local conditions vary widely ‒ even in an area as small as the Downtown Core ‒ sustainable stormwater facilities must be tailored for specific site conditions and weather patterns. In urban settings with space constraints, flow-through planters and infiltration planters are often the facility of choice. As illustrated on the following page, these planters are structural, andscaped reservoirs used to collect, filter, and infiltrate stormwater run-off . Water flows downhill into one end of the planter; pollutants settle and filter out as the water percolates through a special blend of soil and infiltrates into the ground. Water exits through the planter’s second curb cut, flows back out into the street and enters the next downstream stormwater planter. Depending on the intensity of a particular storm, run-off will continue its gravity run from planter to planter until all of the stormwater planters are at full capacity. If and when the stormwater planters exceed their carrying capacity, the water exits the last stormwater planter and enters the existing storm sewer system through an overflow pipe. Where existing soil conditions do not percolate adequately, a perforated pipe is installed under the planting soil mix through which filtered stormwater is directed into the existing storm sewer system. In this scenario, stormwater is not infiltrated into the ground water, but pollutants are removed and water temperature is lowered before it enters the existing storm sewer system. 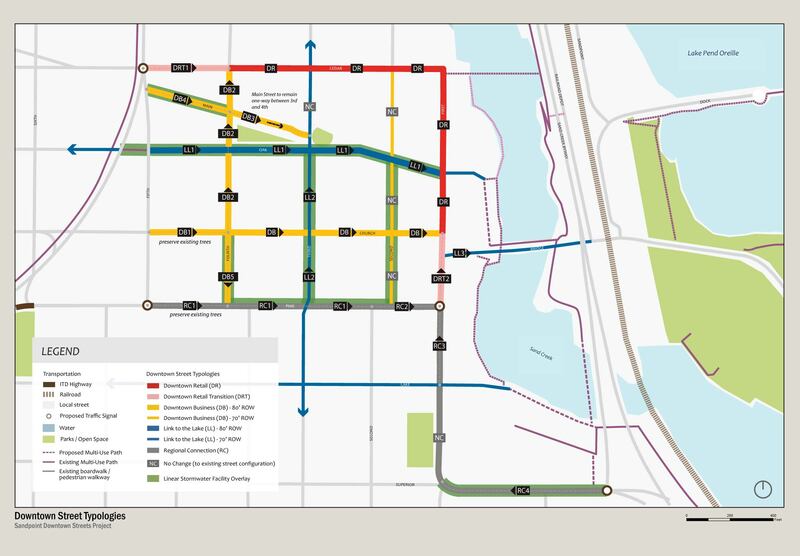 Sustainable stormwater facilities on all other Downtown streets will need to be located in the curb extensions or in larger rain garden sites on public property, so that the full width of the sidewalk is preserved for pedestrian use. Plants are critical to the performance of vegetated stormwater facilities.